Balkans & Beyond, Days 19 & 20: Brașov, Romania to Bucharest, Romania. From the moment we arrived in Romania, almost every person we have met has tried to discourage us from visiting their national capital of Bucharest. 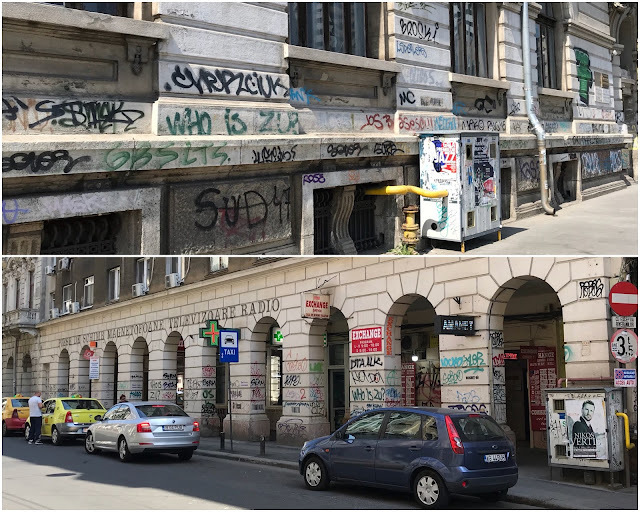 When we landed in Cluj after our flight from Budapest, the Hertz agent remarked about how much nicer people in the north were compared to those in the capital, even before we mentioned that we planned to stop in Bucharest. The same thing happened in Sighișoara and again in Brașov. Not a single Romanian we met encouraged us to go to Bucharest. We both chalked up the remarks to regional rivalries and didn't put too much credence in the warnings. And then we arrived in the city yesterday. Unlike the other three capital cities we have visited recently, Bucharest has a "seedy" appearance. Numerous casinos stoke what we read has become a widespread problem with gambling addiction. 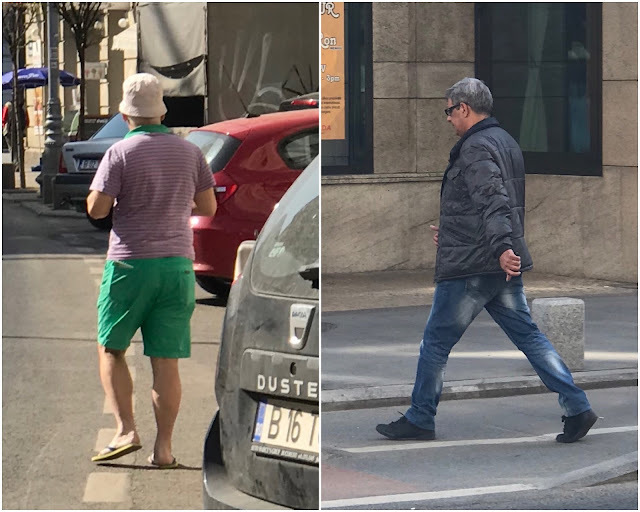 And a vast array of adult entertainment options has made Bucharest one of Europe's most popular destinations for stag parties. It seems more buildings than not are tagged with ugly graffiti. And streets and sidewalks are littered with pigeon droppings and cigarette butts. All these signs were discouraging, but we were still trying to give the city the benefit of the doubt. Until it got personal. On Saturday morning, we set out on foot down Calea Victorei (Victory Avenue), one of the city's major thoroughfares. Numerous major buildings and monuments line its path. Near our hotel, we visited a memorial to Romania's 1989 revolution to overthrow the Communist government. Named the Memorial of Rebirth, the monument was unveiled in 2005. As is common with such matters, its design did not meet with universal approval. Vandals soon expressed their contempt graphically. This monument in the nation's capital city on a major avenue, commemorating a critical historical event, has been treated with disdain and disrespect by both the vandals and the government which should be maintaining it. In 2012, the marble pillar was defaced with a large splash of red paint just below the metal crown. In 2012. 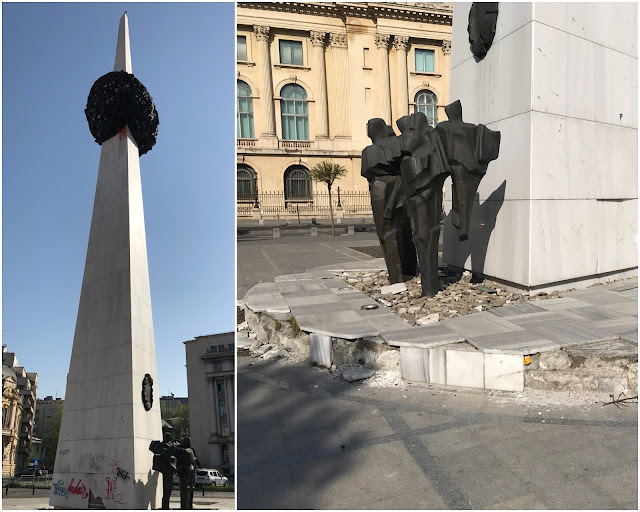 And somehow no one has found the time or resources or wherewithal to clean this national monument in the six subsequent years. Nor clean the easily reached graffiti off its base or replace the marble tiles which have been destroyed. While we were marveling over the neglect, we noticed an oddly attired man wandering around in the square. Dressed in bright green shorts, a pink and green striped shirt, flip flops and a bucket hat, he was hard to miss. In Miami, someone in this attire would blend in and might be overlooked. Here he stood out from the crowd. And this is where our objections to Bucharest got personal. Shortly after we saw the little man at the square, we found ourselves in a fenced parking lot we had entered to get around where vendors were setting up for a food truck festival. As we exited the parking area, we walked behind a building to circle back around to Victory Avenue. Suddenly, the little man in the clownish costume appeared, map in hand, said he was from Italy and asked if we knew spoke English and where we were from. Then he wanted to know how to find the Parliament building. Hold up! From Italy? Dressed like that? Uh, no. What's up with this implausible story? Before we had a chance to tell him to ask a local and walk off, a scruffy looking guy in dirty jeans and a black jacket suddenly appeared, pulled out his wallet, opened it as if to show some type of ID and said he was a police officer. He wanted to know if we were with the "Italian" guy and demanded to see all of our passports. To say that the entire situation smelled fishy is a gross understatement. While Ken pretended he might take out his passport, I told the guy he didn't look like a police officer, asked where his uniform was. He pulled out the wallet and flashed it again. We said, "No, we're not doing this. You are not a police officer." And we walked quickly away, thankfully hearing no objection from the "officer" or his colorfully dressed partner in crime. Nor did they make any attempt to follow us. We would not return that favor. When we reached Victory Avenue, we popped in at the Novotel hotel for a pit stop. As we were about to leave, Ken noticed clown man walking past the hotel. (Who could miss that dazzling costume?) We rushed out to the street and called after him. What a surprise to see that his partner was just a few feet behind him. After I yelled out that the police were looking for them and wanted to talk to them, they turned and saw that it was us and that we were taking pictures of them. That apparently was their cue to split up and go in different directions. While the "policeman" strolled briskly across the street, we pursued the clown man around the next corner, and that little guy could really move in those flip-flops. "Hey, Mr. Italy! Stop! We found out how to get to Parliament. Stop and we'll help you." He speedwalked faster. Since we weren't sure what we'd do with him if we caught him, we finally slowed down and gave up the chase, yelling one final parting shot after him: "Arrivederci, Signore Italy! The polizia are looking for you!" We continued to do some sightseeing after this experience, though our enthusiasm had waned significantly. Needless to say, we were far more wary of our surroundings and found ourselves looking around us more often. Interestingly, we noticed many other people on the streets doing the same thing. Tomorrow we'll fly to Chișinău, the capital of Moldova. We can't wait, especially after reading a post about the city by a Polish travel blogger—"The Most Boring Capital in Europe Yet Still Worth a Visit."